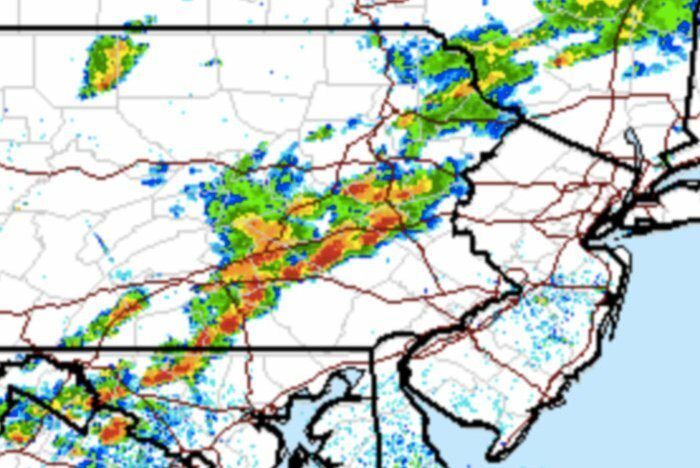 About 4:45 p.m. Friday, National Weather Service enhanced radar indicated the line of storms moving east toward Philadelphia. Severe thunderstorm and flash flood watches are in effect for the Philadelphia region, and a long line of storms – stretching from Maryland to northeastern Pennsylvania – is making its way east at 30 mph. Heavy rain (as much as 2.5 inches expected), lightning, 60 mph wind gusts and quarter-size hail is expected to begin soon and roll through the city, suburbs and South Jersey by 9 p.m., according to the National Weather Service. Higher amounts of rain are expect in the southern parts of the region. The flash flood watch is in effect until midnight. The storms are rolling through the Lehigh Valley first and will slide eastward through the city and eventually off the coast of the Jersey Shore around midnight as a cold front moves in overnight. It was swamping parts of Berks County around 5 p.m. and had reached Kennett Square, Chester County around 5:40 p.m. Earlier this afternoon, in Lancaster County, a tree fell on a car occupied by a man in his 60s, who was injured, WGAL reported. The weather service cautions drivers not to drive on flooded roadways. With low-level moisture in abundant supply, and drier air not expected until Saturday morning, widespread fog is likely overnight, forecasters said. It could be dense in places. The low temperature Friday night will be in the upper 60s to low 70s in Philadelphia and the Jersey Shore, and somewhat cooler in the Poconos.